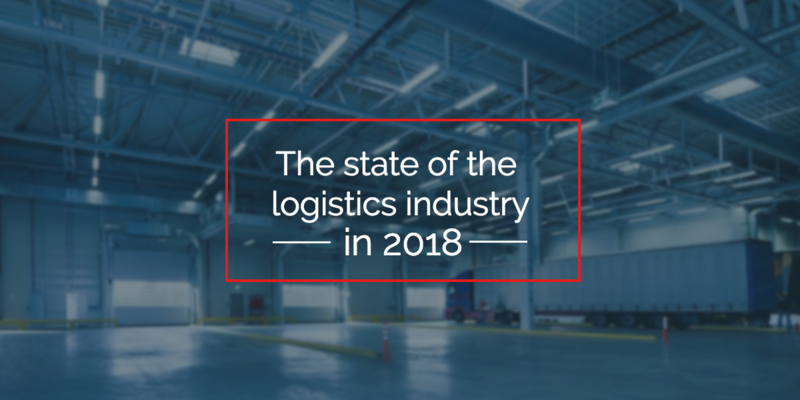 The logistics industry has experienced strong growth this year, but a rising volume of cargo brings capacity issues that will cut into many companies’ margins. Let's take a look at what’s causing these issues—and what strategies you can use to succeed in the second half of 2018 and beyond. E-commerce trade, capacity crunches, and rising transportation costs define today’s state of logistics. Economic growth and retail sales continue to rise in 2018, with the GDP rising 2.9% and U.S. exports increasing by about 14% this year. High consumer confidence and new e-commerce sales have driven this growth. Projections show the economy will continue this growth trend for the next few years. All this means increased demand for shipping services. Yet even as demand grows, it becomes more difficult for shippers to find the required capacity. Many blame this on the driver shortage, ELD regulations, and new trade policies. Shipping managers will need to understand these problems and adopt new processes and technology to overcome them. The lack of truck capacity continues to be a big concern for many logistics managers. One in five companies will experience a truck availability issue in 2018— twice as many as in 2016. Load-to-truck ratios have increased by 21%, and estimates show most companies will use their trucks at near full capacity this year—leaving little room to handle new demand. With contract rates up 28%, many shipping managers will have to look for alternative solutions. Shipping brokers can help by negotiating more reliable contract rates, as well as implementing intermodal transport and retail consolidation. Lack of warehouse space is another concern. Available space has declined 32 quarters in a row, and lease rates have risen 6.6 percent in 2018 alone. Some manufacturers opt to use local warehouses in their service areas to be closer to customers and to improve last-mile deliveries. This is particularly important for e-commerce businesses, as logistics plays a crucial role in customer experience. Given this, constructing new warehouses is difficult because real estate availability in populated locations is often rare. Meanwhile, existing warehouses in urban areas are often outdated and can be slow to improve their technologies. E-commerce businesses will need to push warehouses to adopt more sophisticated technologies, like inventorymanagement systems in order to keep up with the demand. The good news is that over the next few years, many warehouses will start upgrading their tech. However, it is likely that new infrastructure costs will add to the already high cost of the supply chain. The industry is now 50,000 drivers short for the current logistics demand. And unfortunately, many potential new drivers are choosing to avoid the industry because of poor working conditions, strict regulations, and the possibility of technology automating their jobs in the future. These obstacles are also causing many of today’s drivers to leave the industry to transition to a more stable career. With the driver shortage, shipping managers must work hard to appeal to carriers. Earning preferred shipper status can help persuade carriers to want to work with you over the competition. Despite two years’ advance notice, many shippers and carriers are still adjusting to the new electronic logging device (ELD) mandate. The ELD mandate came into effect at the end of last year, and phase three compliance will go live in December 2019. Six months in, it’s taking an average of four hours longer to transport loads. Drivers now have to follow hours-of-service laws more strictly than before electronic logging. Longer routes will now require additional days to complete. As a result, smaller carriers will avoid shipments over 450 miles. Shipping managers can proactively tackle these challenges by informing their teams about ELD workarounds and making sure drivers are prepared before they leave. Proactive action items include double checking shipment dimensions, creating shipping documents in advance, sending paperwork to carriers before pick-up times, and always keeping communication lines open. Fuel and freight rates have increased by 27% and 22% respectively. U.S. business logistics costs went up throughout 2017, with a 7% surge in transportation costs. The biggest hikes were in dedicated fleet and rail. Demand for shipping containers has begun to outstrip supply and caused prices to rise as well. The lack of capacity, coupled with a huge increase in demand and economic growth, has driven the increasing rates. Companies can reduce costs by looking to new technologies like the internet of things, omnichannel systems, as well as sophisticated TMS software. Holiday shipping will become even more intense in 2018. Experts predict a 10% increase in U.S. e-commerce sales and a peak logistics season that starts as early as mid-August. Online purchases keep increasing, and consumers also show a renewed interest in brick-and-mortar shopping. This will place greater emphasis on omnichannel supply chains. Some shippers will broaden their LTL carrier relationships to prepare for the holiday shopping season. And many have begun shifting some freight from trucks to intermodal transport, like air and rail services. The new American trade policies hit the ground running earlier this year. The government announced tariffs in March that raised the price of steel and aluminum imports from Canada, the EU, and Mexico. By July, $34 billion of goods imported from China had been subject to a 25% tariff. Preparations were also underway for a 10% tariff on another $200 billion of goods. China will respond with tariffs on $34 billion of U.S. goods, including cars and agricultural exports. The new trade policies could slow the economic output of Southern U.S. ports by at least 7% over the next five years. The slowdown would affect both employment and international supply chains. To succeed in today’s capacity-tight environment, you will need a thorough and modern approach. That’s why we’ve created our comprehensive Logistics Guide to Capacity. In this guide, you’ll learn how the driver shortage and rising transportation costs have caused capacity to tighten. You’ll then discover the four best strategies to overcome these challenges and assure you have enough capacity for your supply chain. Download this free guide and get instant access to the best capacity strategies for supply chain professionals.